We spend many hours in front of our computers, working our hardest on behalf of our clients. However, every once and awhile, it’s important for us to get out from behind our computers and play as hard as we work. To unplug and recharge, the staff at Paragon Digital Marketing regularly heads out together to experience something different — an experience that ideally gets us up, outside and active. This fall, we headed west to Vermont Canoeing Touring Center in Brattleboro, VT to spend the afternoon kayaking and exploring the Connecticut River. We’re happy (and impressed) to report that none of us fell in “the drink” and that the grey clouds overhead held in their rain. 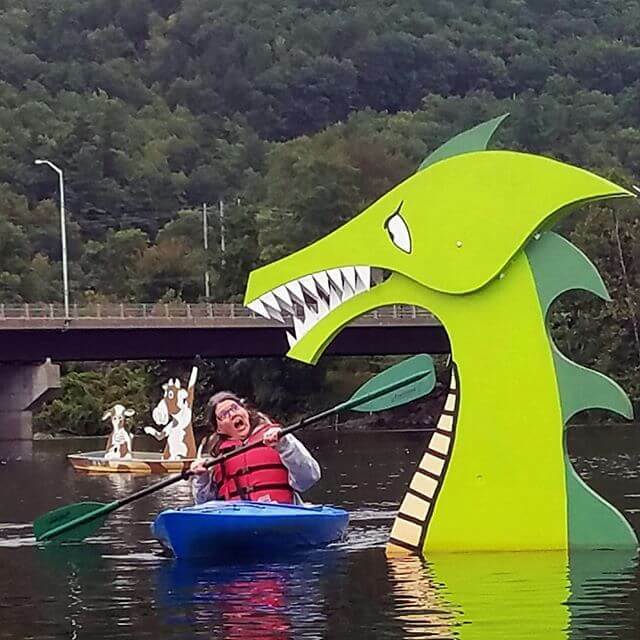 Some highlights: We had a very close encounter with both the Sea Serpent of Brattleboro and a resting Bald Eagle. We also enjoyed some incredibly tasty BBQ at Top of the Hill Grill, while enjoying the company of our coworkers. We’re looking forward to our next outing – a Night at the YMCA, perhaps? To solidify our commitment to workplace wellness, such as offering our staff opportunities for physical activity (AND FUN! ), we became a Healthy Monadnock Organizational Champion this year. We are now one of 165+ local businesses and organizations working to make their workplace healthier for employees. Active living is important for us all — to stay healthy, keep our minds sharp and stress levels in check. Discover more about Paragon Digital Marketing’s company culture (and current job openings) at our Careers Page.